Sasha Says: How do I Blush? A few years ago I discovered Everyday Minerals and started wearing their foundation. I also purchased quite a few of their blushes, which I wore for a while. But I finally realized that they end up turning a very unflattering shade of orange on me, no matter what shade they start out. So I've trashed all my EDM blushes and have collected an arsenal of blushes much more flattering to me and my pretty damn pale skin. 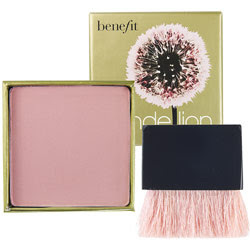 My first love is Benefit Dandelion, which I purchased from Sephora for $28. This rocks my world and lasts forever. Promise. But throw out the brush that it comes with and use your own blush brush. This goes for all Benefit boxed powders. 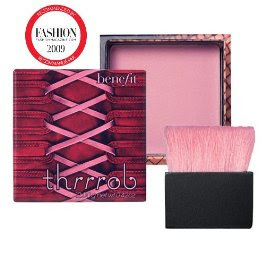 I also love Benefit Thrrrob, which I also purchased from Sephora for $28. This is a bit pinker and has a bit of shimmer in it, but not too much. Thrrrob appears to be out of stock at Sephora right now. 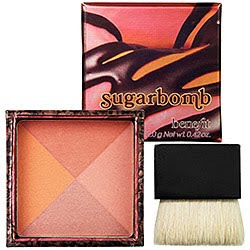 My newest Benefit fave is Sugarbomb, which is gorgeous! Also purchased from Sephora for $28. Swirling all those colors together turns out to be a perfect flush for me. 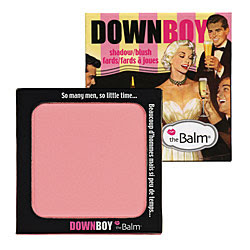 A brand-new find for me (Thanks to the Muse) is theBalm Down Boy. 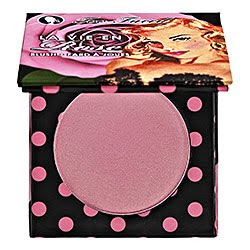 This is very pigmented, so you just need a little bit, but it give me a great natural glow. I purchased this for $20 from Sephora. And this weekend I got in my order from Too Faced and got this beauty- Le Vie En Rose, which retails for $19.50, although I only paid about $14 during their sale. It has quite a bit of shimmer, but I think it's so pretty. OMG, girl! have you tried their 'hoola' bronzer?? it's THE BEST if you want a little "tan". you can use a little or a lot and it blends beautifully with all skin types. i use it and my mom uses it!!! for real, yo! Thanks Liz! Next time I'm in Ulta I'll swipe some on my wrist and see what it does! My current favourite is Benefit Coralista, but I hope to get my paws on Sugarbomb soon. I've been drooling over the swatches I've seen. CucumPear- I think you'll love Sugarbomb. I was going to get Coralista for my mom, but I picked up 6 Cargo Lagunas for her during the Sephora sale last week- it's her HG.